The state received a $65 million dollar grant to accelerate health care innovation in our state. The project could save businesses, government agencies and others who pay for health care roughly $1.05 billion during the four-year project. Washington state just received a very nice Christmas gift from the federal Center for Medicare and Medicaid Innovation (CMMI) in the form of a $65 million grant to accelerate heath care innovation in the state. The grant will allow the state to implement key elements of its Health Care Innovation Plan. The grant is recognition of Washington state’s commitment to bold, system-wide change. The transformation that the state is seeking to make links clinical and community factors that support health, spreads effective and integrated value-based purchasing and care delivery models, and has the potential to generate $1 billion in savings across all payers. 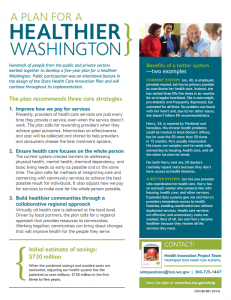 All of this work is founded on the vision of promoting the Triple Aim: better health, better care and lower costs. In its role of convener, the Alliance was able to contribute to the Health Care Innovation Plan. Over a five-month period, the Alliance brought together more than 50 thought leaders in health care, business and labor and state government to develop a change management strategy for transforming the health care delivery system. By design, the Alliance’s work stream focused on health care delivered in the hospital and ambulatory care settings (provider facilities and offices.) The emphasis of the work was on strategies that can be aligned and implemented across multiple payers, providers and purchasers to significantly accelerate health care transformation across the state. The new grant is an ambitious undertaking for a four-year project. It will require collaboration among all the stakeholders in health care—providers, health plans, purchasers and consumers—and a lot of hard work. But the reward for success would be tremendous: a sustainable health care system and improved health for the residents of the state.